CBSE 12th Economics Exam Date 2018 :- CBSE Re-Exam Date 2018, CBSE Re Exam Date Sheet 2018 Released Check Official Notice for the CBSE Re-Exam Date State Wise. The protest is on full fire by the students of CBSE board. on 28th CBSE finally accepted the news of paper leak and announced that the examination will conduct again. 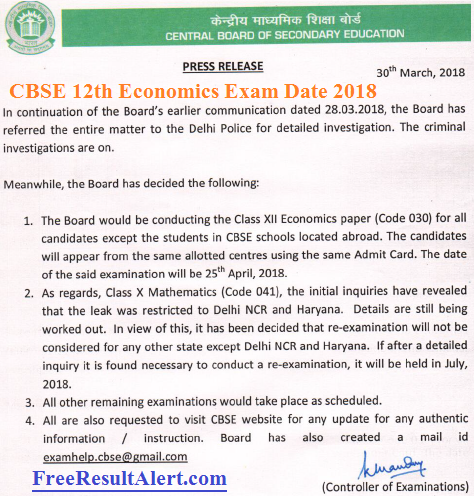 Class 12th economics paper was conducted on 27th March 2018 which the board said that the CBSE 12th Economics Paper Was Leaked. Now the CBSE has stated to announce a new CBSE 12th Economics Paper New Exam Date 2018 State Wise. According to media resources, CBSE economics paper will conduct in Last Week of April 2018. This is done to not affect the other subject papers. The fresh update from crime branch are given below. It seems that the CBI has reached the criminal. Let’s check the complete news. When we see these kinds of illegal things happening openly then a simple thought comes in mind. That there are only two things lack from our education system. 1st is Education and the 2nd is System. This year 19 Lakhs Students have participated in the 12th board CBSE exams. Nearly, Students was waiting for the CBSE Re Exam Date 2018 After doing a year long hard work and sacrificing all the fun this is what students are getting. Prime Minister Mr. Modi18lso felt very bad after hearing this news and he strictly instructed the authorities to announced about the CBSE 12th Economics Exam Date 2018. And also investigate speedily under this issue. The CBI has got the clue of criminal and now the announcement is going to do very soon. CBSE 12th Economics Exam Date 2018 is nearby will be fixed i.e. 25th April 2018. However, this is a tentative date. Students should wait for the official press release. Students are very frustrated and nervous after this. They are unsure either the 12th New Economics Paper 2018 will be difficult. It is up to the CBSE and the govt. now. How it will give justice to all the students of our country. नोट – सीबीएसई के 12वीं के इकोनॉमिक्स अर्थात अर्थशास्त्र के एग्जाम डेट से सम्बंधित किसी भी प्रकार की समस्या एवं सुझाव हेतु आप निचे कमेंट कर सकते है ! हमारी टीम आपको पूरी सहायता करेगी !! The examinations are pushed forward and CBSE can announce it till Sunday. The announcement of CBSE 12th New Exam Date 2018 will be done at cbse.nic.in. So it is advisable to the students to stay in touch with the official website. The main question is why all students appear in examination again if they have done nothing. Those who are involved under this crime should appear in the exam and the criminals would be charged for this act. There Choose the “Press Release for CBSE 12th Economics Re Exam 2018 Date” Option. Open the PDF File & Check the CBSE 12th Re-Exam Date Sheet 2018 for Economics Paper.